On Friday, August 18th, a large portion of a major city in North Carolina was shut down over a rumor – that the KKK was going to march on the city at noon. What follows is an outline of the events of that day as well as questions about what has turned out to be the #DurhamHoax. A rumor just shut down part of major NC city. Let that sink in. 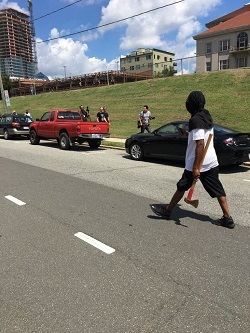 A rumor was started about a KKK protest in Durham at noon on Friday. It never happened. This is what did happen. Two individuals seem to be at the origin of the #DurhamHoax rumor: Lawyer for the Durham statue vandals, C. Scott Holmes, and Durham Councilwoman Jillian Johnson. Holmes appears to be the first to tweet out the rumor at 9:44 a.m. I tweeted to Holmes asking for his source of this claim. Holmes has not responded. First appearances are done, White supremacists arrive at noon. Within one minute, at 9:45 a.m., Durham Councilwoman Jillian Johnson retweets Holmes. It is worth noting that Councilwoman Johnson has a personal interest in these protests and is affiliated with several of the groups involved in raising money for legal expenses for those arrested for the toppling of the statue. Johnson, through Southern Vision Alliance and the Durham Solidarity Center, has affiliations with groups involved in the “counter protests” held during the #DurhamHoax as well. How these have not been seen as a conflict of interest up until now is unknown. Helping to further Holmes and Johnson’s rumor was the progressive liberal publication, Indyweek, who publishes an article online by 10:37 a.m. The article’s opening paragraph is literal hearsay, with no verification from the source. Emphasis added below. Ms. Willets heard this from what source? The article doesn’t say. This is irresponsible and loose reporting at best. American Lens has reached out to the Durham Sheriff for comment on the Indyweek article but did not receive a reply by publishing time. Since then, the Sheriff’s office has responded. Spokeswoman Tamara Gibbs responded to our inquiry and expressed that the Sheriff wished to convey neither Holmes nor Johnson reached out to him for explanation prior to tweeting their concerns. “We’re aware of the concerns posted on social media; however, our critics were not sitting in the Command Post monitoring and reviewing incoming intel throughout the day, which included rumored Klan sightings with the potential of putting lives at risk. Furthermore, the Sheriff’s Office had a duty and obligation to take precautionary measures, including notifying leaders in the community of the potential of a counter protest to the demonstrators on Monday evening. Sharing that information with key individuals, including a representative of demonstrators who were staged outside the courthouse Friday morning, was in no way a signal for them to independently sound the alarm ahead of law enforcement, potentially triggering needless panic and anxiety. Our goal was to avoid the possibility of groups with opposing viewpoints violently clashing in the streets of Durham. A tornado watch is not the same as a tornado warning. My Agency was still in the process of verifying the information that was shared as a courtesy and in an abundance of caution with key individuals. A few minutes ago, Durham City Council member Jillian Johnson and Scott Holmes, the attorney representing the eight who were arrested for toppling a Confederate monument Monday, tweeted that it’s happening. Are you following this so far? The lawyer for the vandals who ripped down a Confederate statue and a Durham Councilwoman tweeted out allegations and rumors as fact. Within an hour of the rumor first being tweeted, an alphabet soup of progressive activists begin showing up in Durham carrying signs and banners. Roads are blocked off. Businesses closed early. Local media cover the event non-stop. The day proceeds and there isn’t a single verified report of a KKK member or white supremacist. The only ones who did show up, illegally and without a permit, were “counter-protesters”. It isn’t unreasonable to offer the possibility this was not spontaneous. The rumor was a purposeful lie and quite possibly was a PR stunt aimed at distracting from the charges filed against activists from a communist organization who ripped down a Durham statue. This whole chain of events smells from top to bottom. The City of Durham verified that not a single event permit had been issued for Friday the 18th. The city’s official account used the hashtag, #StopTheRumorsDurham. At no time did the Durham Sheriff’s office acknowledge that a ‘hate group’ had plans to march on Durham. In fact, the only protest to be monitored that day according to the Durham Sheriff was that of the “counter-protesters” as it was not legally permitted. The Durham Sheriff’s Twitter account also asked citizens not to spread rumors and used only “VERIFIED” information. We want to encourage people to rely on VERIFIED information. There have been numerous reports of the KKK coming – all unverified. Yet the rumors persisted and even escalated. About 10 minutes after Holmes and Johnson tweet out the rumor the KKK and white supremacists were coming, #DefendDurham and #KKKAlert are showing up in feeds on Twitter. Here are a few of the first tweets found. Klan is gonna march on Durham's new courthouse at noon today. See y'all there. One early tweet of note is that of D’Atra Jackson, a BLM activist. D’atra claimed in a tweet that she was the ‘queer black woman’ responsible for pulling down the Confederate statue in front of the Durham Courthouse. Within the hour, far left activists including Antifa, Black Lives Matter, BYP100, World Workers Party, Industrial Workers of the World, Triangle Indivisible Group, Triangle SURJ and more were converging on downtown Durham. Claims that the KKK had shown up and unverified rumors that there were armed white supremacists roaming around Durham were spread around on social media just minutes before the alleged ‘noon hate march’ was supposed to happen. Once again, Councilwoman Johnson appears to have been tweeting unverified information and asking people to just ‘trust her’. I tweeted directly to Johnson about her claims in the above tweets. The Councilwoman has yet to respond. More false information followed, including a tweet from Loan Tran – the organizer of the Communist World Workers Party. Tran arrested for helping topple the Durham statue last week. 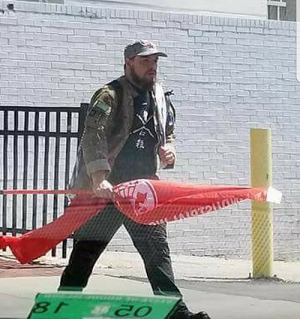 This is actually a counter-protester carrying the Industrial Workers of the World flag. The hat the person in the photo wears is a Maoist red star of communist China. That is not something you’d typically see a KKK member wearing. The flag seen in the above photo can be seen being waved in the middle of the street later in the day outside the Durham jail. A member of the NC media working for WUNC tweeted out that a “Motorcyclist with confederate flag on jacket just drove down Main Street.” The tweet did not offer context, an image nor corroboration. The same reporter, Jason deBruyn, would also tweet an image of a black man walking up the middle of a road wearing an ad-hoc executioners hood and carrying an ax. It is unclear if this man was affiliated with any organization and the footage seems to indicate he perhaps disagreed with the protesters was just trying to get through the crowd. In particular, the man is seen literally being screamed at by Triangle Indivisible Group leader, Elena Ceberio. A second man in a blue tank top seems to intervene and hugs Ceberio. Ceberio led the failed protest of a Pro-Trump rally in March of this year in Raleigh and another arguably failed protest in June. She also has been arrested at Moral Monday. Ceberio is the woman dressed in black with the red bandana and the white hair in the clip below. A slightly larger, clearer version can of the clip can be viewed here. The media’s favorite go-to line since the covering of Occupy Wall Street has been that of “mostly peaceful” protests. In the case of the #DurhamHoax, that description would be accurate. However, once the bulk of the protesters started to leave, a group of about two dozen decided to start a confrontation with Durham police in riot gear. The protesters refused to comply with police instructions to disperse, protesters yelled and chanted at police and one threw a bottle of water at police. All of this was broadcast live on CBS North Carolina. While the #DurhamHoax sucked all of the oxygen out of the air, four protesters were arrested in Asheville trying to remove Confederate monument. Those arrested include, Nicole Townsend, age 24, Amy Cantrell, age 45, Hillary Brown, age 30 and Adrienne Sigmon, age 34. All of the women are from Asheville and were charged with damage to real property. Duke University removed a Robert E. Lee statue from the entryway to Duke Chapel during the middle of the night. In neighboring Chapel Hill, the mayor called on UNC to take down Silent Sam statue. Editorial Note: This article has been updated to include a statement from the Durham Sheriff’s office. This entry was posted in Am Lens, POLITICS NC, Shutuppery, THE LEFT and tagged Durham, Durham Hoax, Jillian Johnson. Bookmark the permalink.